Kulia turns to me, lightly touches my forearm just so to grab my attention. Touch is my love language. Wait, is touch one of the languages? It isn’t true but I smile. See, I do this with things I love. I don’t give them as much credit as I should. Nightmare Before Christmas is my favorite movie and yet I have a bajillion Little Mermaid items. Almost no NBC things. Doesn’t mean it isn’t my favorite. 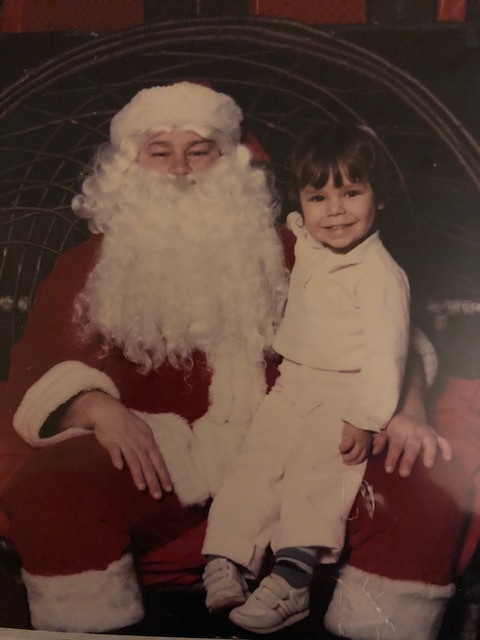 I have always loved Christmas. Almost as much as I love Halloween. Perhaps it’s because I think of music when I think of my absolute favorite any thing as opposed to my second or third favorites because even though Kulia says you can only have one favorite “whatever”, I DO NOT LIVE BY THAT RULE. When you hear a song on the radio that catches your ear, you proceed to play it to death over the course of the next month or so until you absolutely cannot hear one chord of it for the next few years. I’m like this with everything. I beat all my second loves to a pulp. Christmas is no different. I make it Navi-dead. Not quite the same with Halloween. We were walking through JC Penney two Christmas seasons ago when a dress stopped me in my tracks. I turned to her and loudly exclaimed that I had to have it. This dress made my heart so happy, complete with adorable little Santas all over it. Unsubtle in an artful way, much how I think I can be, but maybe that’s ridiculous. Yes. The dress was ridiculous. Her look of incredulity surprised me. “No. You do not need that dress,” she replied. And with seven words she effectively brought forth the stubborn Vee, of which she has had the pleasure of dealing with so many other times. Look. I don’t re-wear dresses. It isn’t my thing. When we get fancy I love to go all out and then that is it for that outfit. We always take a ton of photos and I don’t like to see myself in the same things. She reminded me of this in the aisle of the store. Well, that became a double-dog dare if you ask me so I promptly promised her that I would not only wear it more than once, but I would wear it for a week straight. And it was game on. Every day I would wear it but with a twist to keep things interesting. It took my boss until day four to realize I hadn’t really changed. Friends on my social media pages were anxiously anticipating my new look each day and we were all laughing. What started as a joke and an “I’ll show you,” became a fun week full of holiday spirit in 2017. What I realized was that it couldn’t stop with just that one year. Naturally, as Christmas got closer this year, faster than usual and with more gusto than expected, I had to find a new dress. Except, instead of wearing it for one week, this time I was going for two. And I announced it early enough and presumably with enough excitement that many of my friends decided to join us. Hawaii. Washington. Texas. Florida. All-over-friends. It was incredible. Some for the two weeks straight. Others just during work days. A couple of us did not stop and went for the whole month. The whole month. It was awesome. But more importantly, and the reason I began this blog post, is the power behind the dress. It never ceases to amaze me when I receive messages from people I know and love about how fun seeing my Christmas dress posts are but what really floored me this year were the ones from people I have never met. What began as a silly challenge, really to myself more than anybody, became an inspiration and source of cheer for others. You see, up until recently, I was working really hard on some goals and then one day I woke up and I had lost my motivation. I know results take time, no matter what they are in regards to, but sometimes they move slower than a turtle in peanut butter and I lose my momentum. I have been told I can be encouraging to others but I struggle the most with doing it for myself. When Kulia told me I wouldn’t wear the dress more than once, I made a pact as a WE WILL SEE ABOUT THAT to her, but really it was to me. The friends following along that resulted from me trying to prove myself wrong was uplifting and reminded me that I can do more than I give myself credit for, as silly as it seems. You see, sometimes you need to reset your thinking with something that seems ridiculous so you can keep tricking yourself for the harder things. We can do the hard things. We just have to remember to sprinkle in some fun ones, too, while we are at. It lessens the load on our heart, I think. Flash forward to the dress challenge in 2018, and it was back to a fun goal. Wear a dress for two weeks that makes you smile and every day find a way to change one little thing about it to keep everyone else smiling. As people reached out and became a part of it, I felt my heart swelling. I know it seems small. And it was. But it was something. During the past month, as I shopped for Christmas gifts or ate lunch with friends, laughed with others in a board meeting or met with colleagues at work, the dress initiated beautiful conversations. Some of them merely to ask, “WHY?” <–to which I just shrugged my shoulders and said, “Why not?” Strangers were smiling at me and sharing sweet words about how my Christmas cheer brought them joy. Co-workers hugged me and wished me Merry Christmas for the entire month and that warmed me in ways I never could have anticipated. Little kiddos’ faces brightened up at me just for smiling at them. My love in humanity was restored day by day. And the messages. “I had a rough 2018. I was dreading Christmas. This dress challenge helped kick me out of that funk. (girl, SAME)” “I cannot believe how much joy I brought to strangers when I was out and about and how many came up to talk to me because of this dress! (YASSS)” “You and your dress are wonderful and every time I see your posts, I am happier. (DITTO)” “I told my husband I’m joining you next year and I cannot wait. (NOW TO CONVINCE MY WIFEY)” On and on and on. All the best words that kept my mind spinning with how to keep spreading that joy in 2019 but not just at Christmas-time. I don’t know what that is yet, but I’ll let you know as soon as it happens. And don’t ask me why, because that isn’t even really a question in my book.